If you could live the life you dream of, what would that look like? More important, how would you get there? Craig Coppola asked himself these questions years ago. Dedicated to seven-day work weeks, he found many of his personal passions and goals were not receiving the attention they needed. His company was doing well, but he wasn't fulfilled. Something had to change. What followed was a journey of discovery and growth. Along the way, Craig built several successful businesses, won a Tae Kwon Do world championship, ran over eighty marathons and ultramarathons, served thousands of hours with coaching... and donated time to the community. He's lived a truly Fantastic Life... and so can you. 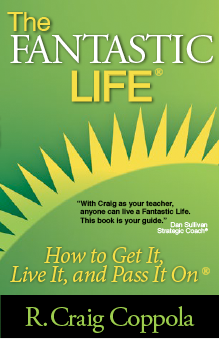 In The Fantastic Life, Craig shares the 18 rules he learned to achieve his Fantastic Life and shows you how to apply them to your life too. "It was an honor to read your book prior to printing and I loved it. The goal of this book is to leave the reader inspired, contemplative, and moved to action and feeling a great sense of accomplishment and pride is what is required to make the most of opportunities and of life. Craig, you inspire me and I am so appreciative."